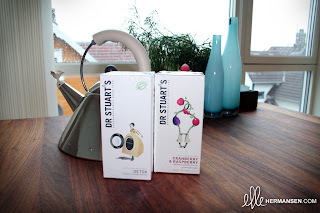 ellehermansen: Dr Stuart's: Extraordinarily Good Teas! After a long day of running in and out of places , through the long, cold downpour outside, I needed a pick-me-up when I got home today. Well, as a tea connoisseur, I am always looking for exciting, new teas to try. "Dr Stuart promises that every asterisked herb is of the highest quality medicinal grade"
Wow!" I said to myself. I must admit the packaging got to me and I loved every bit of the humour wrapped around the very boxes this extraordinary tea lives in. The art is quite dark, with Tim Burton-esque characters that are quirky enough to blow up to display on my wall! I usually like the taste of loose teas better, but I got these, because I just want something quick and easy - and it turns out that they're just as good. The two that I have tried so far are both surprisingly awesome and delish! 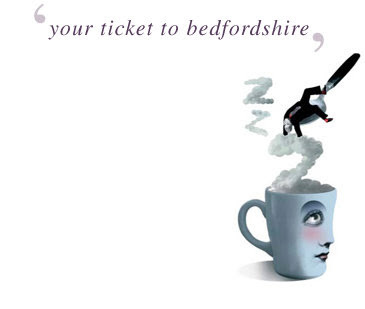 I think you'll fancy a cup of this tea-riffic drink!